BePro listings is the best way to capture submission from admin and/or front end users. If interested, you can allow visitors to search the information that’s captured. 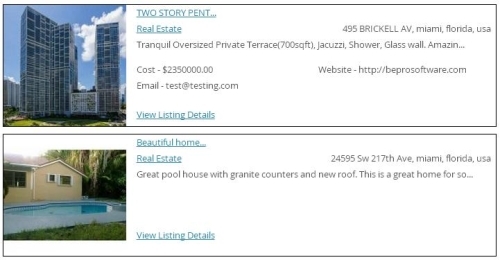 BePro Listings provides a few customization options which work for most users. For others who require further customization of the data that’s captured and showcased, you will need this Form Builder addon. This combination of features is ideal for creating a range of listing sites including, Business Directory, Classifieds, Product Catalogs and other similar websites. This combination of features is unique in wordpress. 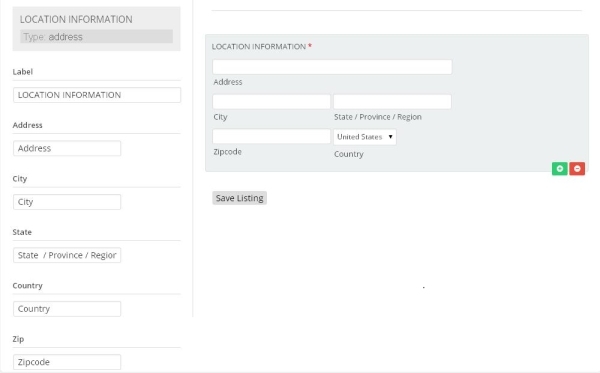 BePro Listings along with the Form Builder allow you not just customize the data that’s captured but those fields can then be designated for search. This includes fields like date, numeric ranges, and others not seen on any form builder, definitely not one for a directory. When you examine the competition closely, you will notice that they do not offer this important feature necessary for any real directory. The combination of features is very flexible. Hide and secure all submissions in the admin or showcase them on the frontend. As of version 2.0.0, you can also submit all submissions to Salesforce. We already offer the option to collect payments with form submissions if interested. Our goal is to make BePro Listings the ultimate solutions for your sales funnel if interested in monetizing form submissions. For those interested, with this solution each submission can have its own page on the frontend, showcasing the info that’s been captured. Each submission is tracked by the form which captured it, allowing you to separate the submissions into unique sections on your website frontend. Alternatively, you can restrict which categories are allowed per form, then separate listings by category. 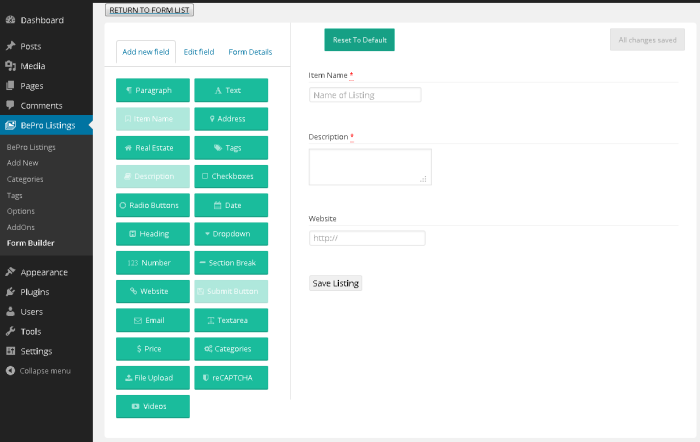 You will love the drag and drop interface with over 20 stock form fields. Configure validation and other options to accommodate your information and language goals. Then allow users to search, filter and navigate the listings like you could, with the basic 100% FREE form that’s packaged with BePro Listings. This addon greatly simplifies the process of customizing the the way you capture and display information in BePro Listings. Some options also allow you to make small changes to how the info shows up in search results or on the individual detail pages. (BETA) Each Form can select a custom listing page template. All submissions generate a Page on the front end known as the details page. The number of File uploads e.g. images, is managed by the Files field. BePro Listings is a set of dynamic templates which you can extend. This form builder demonstrates this principle, by adding a visual interface for manipulating the templates. In other words, where the information and layout was once static, you are now able to dynamically change various elements. Note : There are no new features created by the form builder. You should have downloaded the 100% free BePro Listings plugin, tested it, and be happy with its base features before buying this product. This is a great addition to the BePro Listings product line. Our Form Builder allows you to graphically manipulate various aspects of BePro Listings. 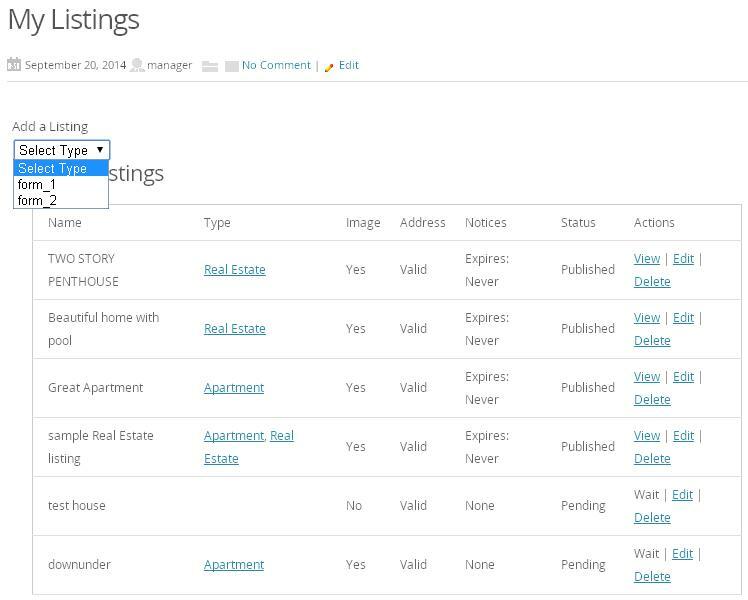 Capture custom info, customize the search fields and select various result layouts. You do all of this via the existing BePro Listings shortcodes and the Form Builder graphical interface. 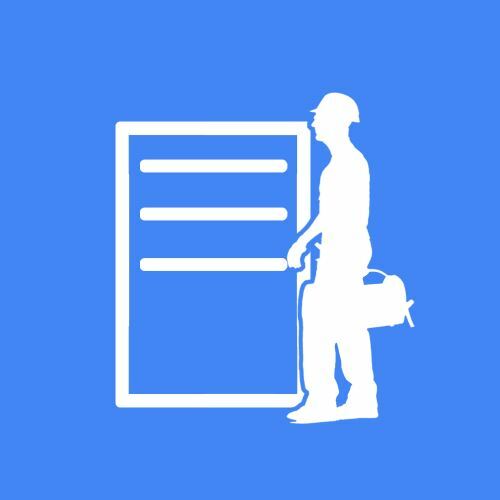 There are so many features provided by this form builder, that it would be overwhelming to list them all here. 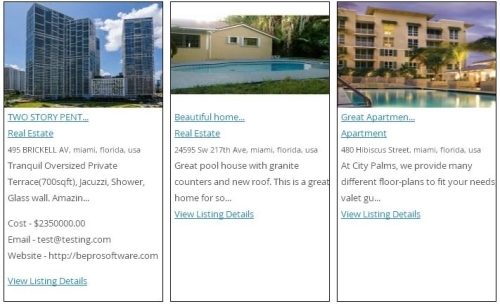 We are litterally allowing you to implement all functional aspects of a listings website. Typically, you would buy a wordpress theme which forces you to use a specific layout and data. This form builder has few limits, which makes planning your website the most difficult aspect. Here we will try to focus on some major features so that you can understand whats possible. Since the Form Builder is built on BePro Listings, you inherit all of its great features. This includes things like, google maps, payment packages, front end submission, searching, and unique pages for each submission. With the power provided by the Form Builder, you can simulate the vast majority of listing scenarios. Moreover, since each submission is tracked by form and by category, you can run multiple independant listing types on one website. View our demo above to see how the drag and drop interface works. Options in the demo are limited; However, you get a chance to see how you would work with form fields. Notice how easy it is to add fields, edit their details and change their order. In addition, we offer helpful aspects like notices while you edit the form. We also disable some fields after they are used, since they should only be used once e.g. item_name and the submit button. This guarantees that you can build forms without any development experience. This intuitive process will allow you to build countless useful forms for capturing and showcasing data. Our Form Builder is very powerful. The custom search fields that you create, work via string matches on a single database table. This is a much faster process than the custom field solution offered by other wordpress form builders. That’s because custom fields require multiple database tables to reference data. This means that our BePro Listings Form Builder will out perform any other solution as listing numbers increase. Some fields have features that others don’t. For example, you can set the heading field to show in the form and hide it on the details page. You can also set text fields to be searchable via the search filter and visible in the search results. This precision allows you to customize the experience for users submitting listings and those simply visiting your website. The default BePro Listings layouts and search options work great if you don’t want this advanced control. Ok, we will stop here. Hopefully you can see that we are trend setters, not followers and you won’t find another Form Builder which works like the BePro Listings Form Builder. Click the documentation link above if you are ready to delve deeper into the possibilities of our BePro Lisitngs Form Builder. Also remember that we have a free forums area where you can ask questions before and after your purchase. This Form Builder allows you to setup a scenario where forms are linked to categories or payment packages. If your setup requires that each category use a different form, you can select that option. Alternatively, if you would like to offer more features depending on the payment package selected, you can set that up. An example of a setup which would use a dynamic form based on categories would be a product catalog. Products in each category can have a completely unique form. You do this by simply adding or editing a BePro Listings category in the admin area. Alternatively, dynamic forms based on Payment Packages would be the preference for a classifieds website. You can give your users an incentive to get the more expensive package, with a form that offers more information and features. Learn more about these features in our documentation. Fix details page display of selected checkboxes. Improved activation which suppresses any errors. It works great, I loved this recently released plugin. No other form builder plugin can do what this one does, it has some cool features which are really unique. It’s so simple to use. You definitely don’t need to be a developer to use it because it’s user friendly. Looking forward to the addition of multiple form support. Can’t recommend enough! I used mine for events but it lacked a time field….within 2 weeks the developers added it on my suggestion. Thats amazing! 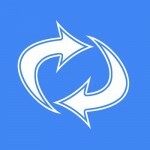 Plugin works great but more importantly the developers are strongly behind making it bigger and better!